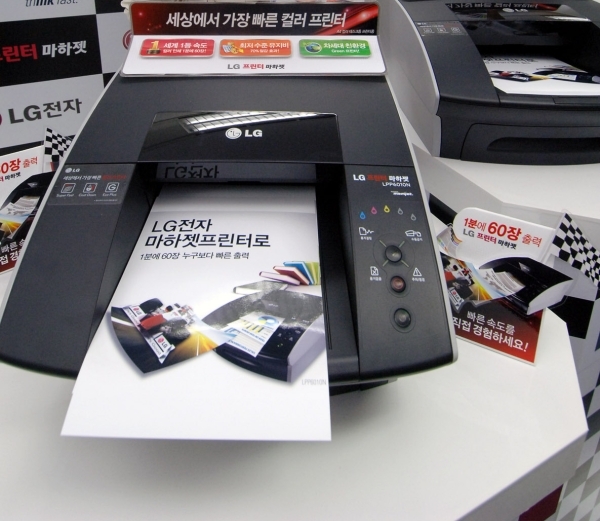 SEOUL, June 21, 2011 — LG Electronics (LG) and Memjet, a global provider of high-speed color printing technologies, today jointly introduced Memjet’s breakthrough office printing technology into the Korean market. The Machjet LPP6010N, the world’s fastest A4 color desktop printer, will be available this month through authorized LG resellers and channel partners. The Machjet leapfrogs over current printers with high-quality color outputs in 1600x800 dpi resolution at 60 pages per minute. Memjet’s proprietary Page Straight Array (PSA) Technology packs more than 70,000 ink nozzles on a single printhead — 17 times the nozzle density of traditional printheads — allowing the Machjet to deliver more than 700 million drops of ink per second on a page. Printers that are “powered by Memjet” are also energy efficient and less expensive to operate. While competitive color laser printers use on average approximately 600W of electricity during normal operations, the Machjet consumes just 32W. Costs are further reduced via the Machjet’s Hyper Small Drop Technology. The Machjet takes advantage of smaller droplets to minimize the amount of ink required to render clean, crisp text and images at high speed. This technology results in faster-drying ink and reduces the TCO (Total Cost of Ownership) by up to 70 percent when compared to competitive color laser printers.